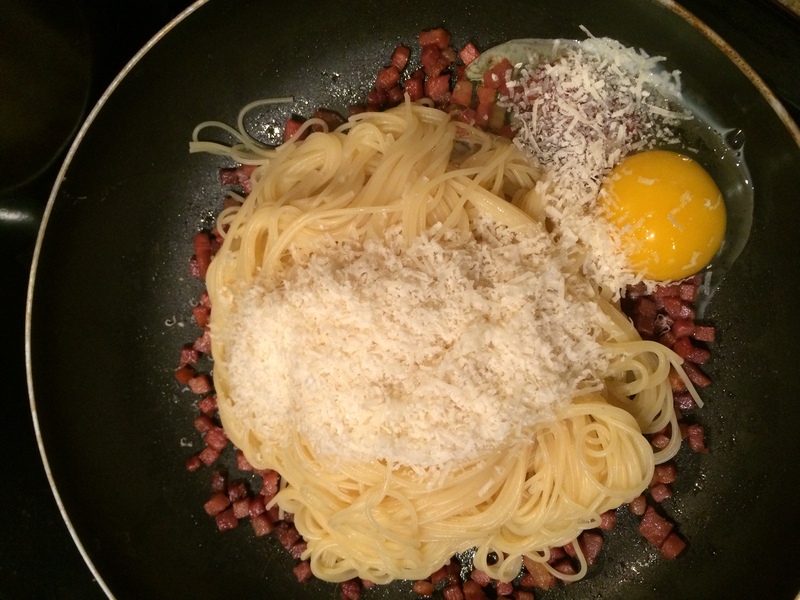 When I first looked up recipes for carbonara, I was immediately intimidated – “I have to make the sauce with a whole raw egg on warm pasta, off the heat, and somehow it becomes a ‘sauce’?” It sounds ridiculous, especially to those who may be weary of raw eggs (I am not one of those people for the record:) ). But once you cook this a few times and get the hang of it, you’ll have this fancy dish in your repertoire to show off at dinner parties! Trust me – it’s not that hard. Seriously. 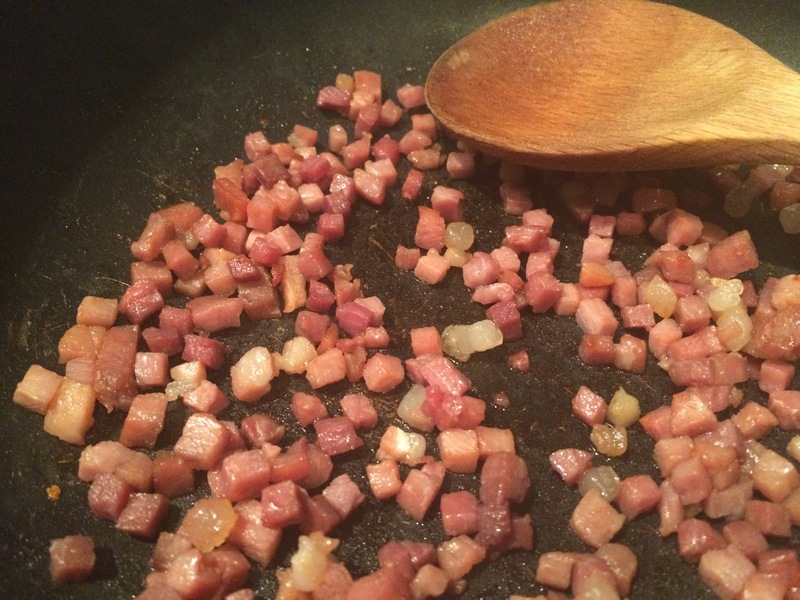 In a large sauce pan, heat the pancetta over medium low heat – you are aiming for it to be slightly crispy by the time the pasta is done. When the pancetta is almost done, add in the peas and butter/olive oil. When the peas and pancetta are hot, turn the heat off on the sauce pan and remove it from the stove. Now pull the hot pasta out of the water and add it directly into the sauce pan along with the pancetta and peas. 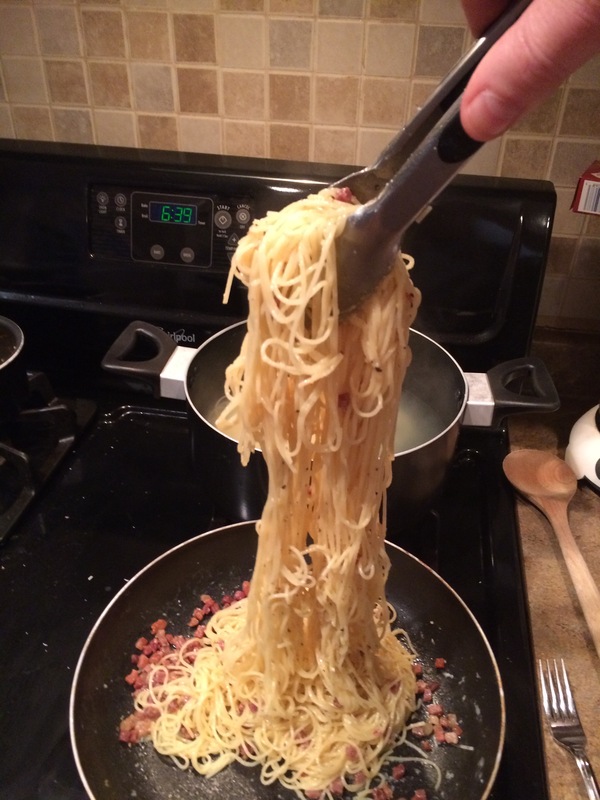 Toss the pasta with tongs in the pancetta, peas, butter/oil mixture until the noodles are coated with the butter/oil. Make a well in the center of the noodles in the pan and drop in your raw egg and cheese. Now use tongs to mix the egg, cheese, pasta, pancetta/peas together almost constantly. I usually grab some pasta from the center and lift it straight up about a foot over and over again. JUST KEEP MOVING – if you slow down too much, the egg will start to scramble, not emulsify and become a sauce. 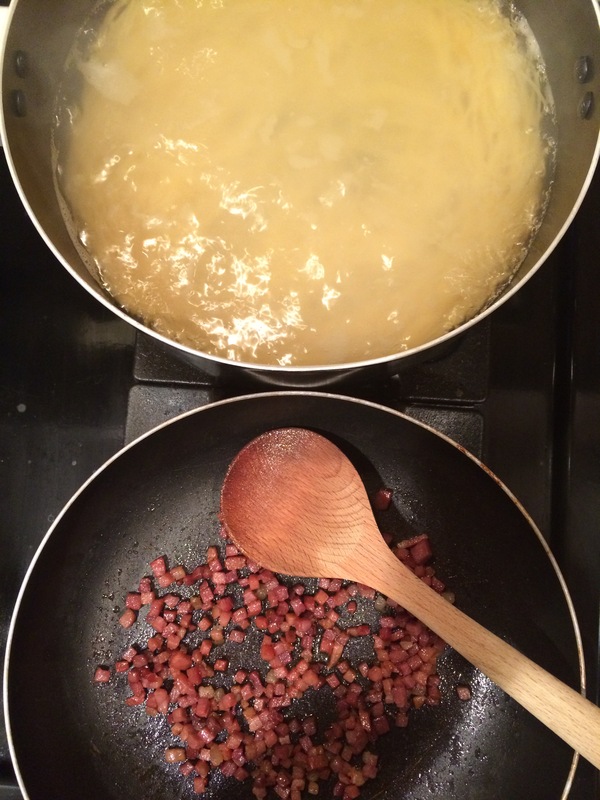 The warm pasta and pancetta/pea mixture will melt the cheese and cook the egg in a minute or two. If it appears too dry, add in a tablespoon of pasta water.